Effective states are marked by a strong respect for the rule of law. Corruption undermines a culture of respect for the rule of law. Instead, government decisions – both big and small – are shaped by corrupt practices. Or, in the case of “grand corruption,” senior officials simply help themselves to public resources in unlawful ways. In the end, though, all states – even the most effective ones – face a perpetual struggle against graft and official thievery. 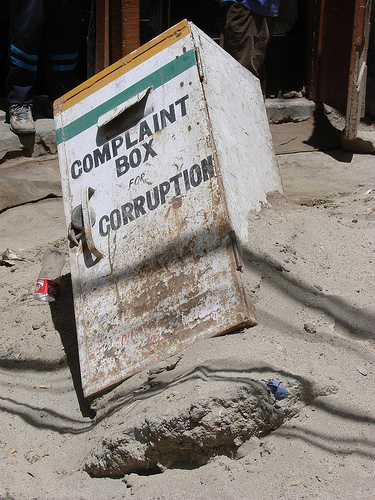 The images below provide some snapshots of anti-corruption campaigns in places as diverse as Detroit, India, and Uganda. An ironic shot (2007) from the Indian-controlled portion of the disputed territory of Jammu and Kashmir. Photo credit: watchsmart (via Flickr, Creative Commons license). This sign from Uganda says it all. When corruption results in ineffective governance, it is indeed deadly. Photo credit: futureatlas.com (via Flickr, Creative Commons license). What does it mean to inhabit a “corruption-free zone”? Photo credit: jbracken (via Flickr, Creative Commons license). 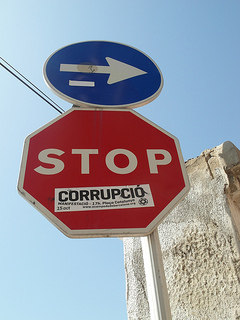 Corruption is universal, as this sticker from Detroit, Michigan, U.S.A. suggests. 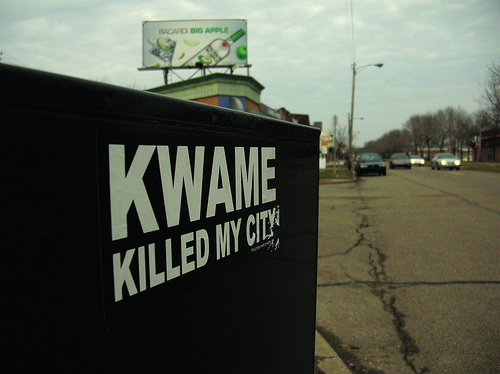 Photo credit: CAVE CANEM (via Flickr, Creative Commons license). A simple, but powerful statement of civil disobedience. Photo credit: Naberacka (via Flickr, Creative Commons license). President Jose Eduardo Dos Santos’ MPLA won another election in 2012, despite protests from the opposition about the conduct of the poll. Photo credit: Oscar Megia (via Flickr, Creative Commons license). Forbes announced last week that the eldest daughter of Angolan President Jose Eduardo Dos Santos is Africa’s first female billionaire. Though much is unknown about Isabel Dos Santos’ climb to this elite club, her status is indicative of the opportunities and challenges facing Angola. For much of its history since independence in 1975, this African state has been wracked by armed conflict, grinding poverty, and bad governance. In short, Angola was a failed state for much of the not-too-distant past. In the case of this lightly settled, oil-rich country, external factors were exceedingly important in Angola’s decay. The country suffered as the site of a proxy war between the Soviet Union and the United States, and involved other states like Cuba and South Africa. Prior to the Cold War meddling, the Portuguese – like the Belgians elsewhere in Africa – did a poor job preparing the colony for independence. When the Portuguese left in relative haste, the Angolans initiated a 27-year civil war that also had significant connections with the global geopolitical struggle between Moscow and Washington. These dark decades can be summed up by a long list of depressing words and phrases: refugees, landmines, official thievery, food insecurity, bombed-out bridges, and empty schoolhouses. After the death of rebel leader Jonas Savimbi in 2002, Angola’s fortunes have begun to improve. First and foremost, Angola has recorded a decade of peace. Economic growth has been impressive, even if concentrated in the export-oriented energy sector. Transportation has improved within the country, helping the country’s many small-scale farmers get their goods to markets. Many refugees have returned from neighboring countries. Lewis is careful to state that he cannot authoritatively comment on the particulars of Isabel Dos Santos’ wealth. The people who can comment on her wealth, likely do not intend to do so. Even so, there are indicators that Angola’s ruling party has been somewhat less corrupt in recent years. New investments have flowed into the country. And, Angola has even remade itself as an immigration destination for financial crisis-weary Portuguese. Yet, there are limits to the gains in governance. According to Freedom House, Angola remains an authoritarian state, despite holding elections. President Dos Santos has led the country since 1979, and looks set to do so for many more. The political opposition remains weak. And given the country’s continued reliance on oil exports (with the heavy involvement of the Chinese state), this is not a good mix for broad-based development. 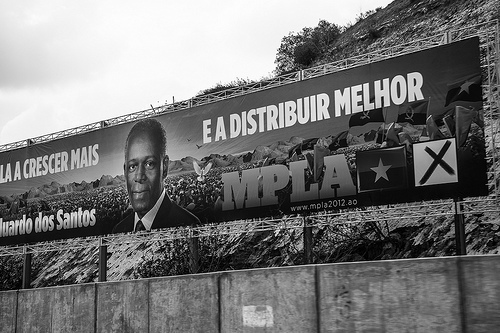 Angola is no longer a failed state, but its foundation for the future is uncertain at best. Human suffering and insecurity worldwide is being caused by fragile states and violent conflict, a world leader has said. Finland’s Under-Secretary of State for International Development, Anne Sipilainen, spoke out at the opening of the recent conference into conflict and the post-2015 development agenda in Monrovia, Liberia. Ms. Sipilainen said more than 1.5 billion people live in countries that are in constant battle with violence and political wrangling. She added that peace processes are being demolished by criminal violence and countries’ inability to generate security, justice and economic development. The conference was co-hosted by Liberia and Finland’s governments in the latest United Nation-led push to involve societies in issues surrounding disasters, conflict and security and how a universal framework can be created. A new approach must be taken to see the development of fragile states, Ms. Sipilainen added. Only then would we see the international partners coming together and witness international money transfer, equality and aid across the globe. Also speaking at the conference, Liberia’s Finance Minister Amara Konneh said almost half of all civil wars and political upheaval in the world between 1990 and 2005 took place in Africa, and its war-related deaths far exceeded all other conflicts in the world. He highlighted the importance for leaders at the conference to agree on how conflict, violence, disaster and fragility hinder development around the world and how solutions must be met. It is recognized that conflict, violence and disaster are huge obstacles which lie in the way of the Millennium Development Goals (MDGs) being met in many countries. The eight aims of the MDGs involve: eradicating extreme hunger; universal education; gender equality; child mortality; improving maternal health; combating HIV and AIDS; environment sustainability; and global partnerships. 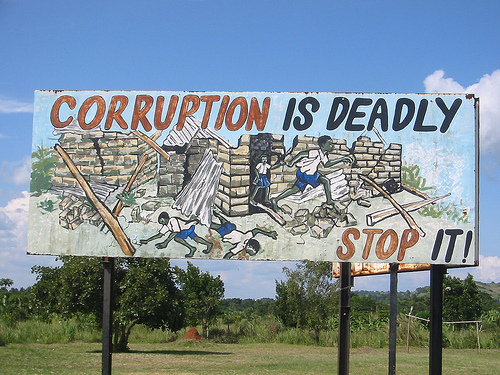 Are Jobs In Kenya Being Killed By Corruption? The reality of leaving school with an education only to find there are no jobs is one frustration many young Kenyans have to deal with. But imagine how it must feel to realize that about 250,000 jobs may never be created because of corruption in your country. The World Bank has revealed in its latest report “Kenya at Work” that the loss of resources at the hands of fraud amount to that quarter of a million number. As the economic climate stands, about 50,000 youths leaving education gain employment, out of a total of 800,000 graduates every year. The World Bank country director, Johannes Zutt, said: “Nepotism, tribalism, sexual harassment and corruption determine who gets these jobs leaving the rest to find their own means of survival.” The World Bank’s research says firms pay up to 12 per cent value of government contracts in order to win them, and four per cent of their sales goes towards bribes. The country’s growth is below the African average and substantially below the growth of its neighbors in the East Africa Community. Mr. Zutt said other obstacles in Kenya’s job creation are access to electricity and poor infrastructure. General election shocks and the Euro crisis have left Kenya’s economy in a “stable but vulnerable” state. An imbalance in import and export has struck over the past ten years, as the fragile state’s imports have grown faster than its exports and the top four exports not making enough to pay for oil imports alone. The World Bank report recommends that manufacturing capacity should be boosted. And, critically, Kenya must deal with the negative effects of corruption on farmers. The collapse of a bank does not always get the attention it deserves. In the case of Kabul Bank, the largest private bank in Afghanistan, the collapse reveals much about the governance challenges ahead for this failed state. On November 28th, the Independent Joint Anti-Corruption Monitoring and Evaluation Committee released its report on the Kabul Bank collapse. Headed by the Slovenian Dragos Kos, the committee issued a stark and troubling picture of corruption at the highest levels of Hamid Karzai’s government. The fraudulent scheme was relatively simple. Politically well-connected shareholders and executives – possibly including Karzai’s brother – issued huge loans to themselves under false pretenses. Over 90 percent of the bank’s loans – worth more than $860 million – were distributed to only a dozen individuals and their firms. At the same time, Kabul Bank officials kept a separate set of books that claimed the loans were issued to a longer and distinct set of borrowers. In the end, the fraudulent loans were put to very unproductive uses, such as the purchase of villas in Dubai. When details of the fraud began to leak in 2010, panic ensued and depositors began a run on the bank. The resulting bail-out – representing up to 6 percent of Afghanistan’s gross domestic product – is a financial and political scandal of massive proportions. The importance of the collapse of Kabul Bank cannot be overstated . . . Every citizen in Afghanistan will bear the [bail-out] cost of the hundreds of millions of dollars . . . This is real money from the annual budget of the government that could be much better spent on other priorities such as education, health care, infrastructure, or security . . . The cost of the Kabul Bank crisis should not only be understood in monetary terms . . . This [social] cost undermines the government and international community’s efforts to build viable institutions in Afghanistan. As the Kos report makes clear, the most shocking aspect of the scandal is not the monetary scale of the bank’s collapse. Rather, it is the corruption and rot within the Karzai government that should get the headline. Electoral fraud, pervasive rent-seeking behavior, and crony capitalism are becoming the hallmarks of the government in Kabul. The story of Kabul Bank is just one more powerful reminder that the state building road in Afghanistan is long and winding, and filled with back-tracking. Though it has many critics, the World Bank Group fulfills many key roles in the global system. One key role is provision of data to policy makers, citizens, and investors. One closely watched index is the “Doing Business” survey, which assesses how easy it is to start and operate a company in different countries. The index formally measures 10 indicators. Examples of these indicators include: ease of registering a new firm; accessibility of consistent electricity supply; credit availability; ease of trading across international borders; and the quality of courts. Each country receives an ordinal ranking, between 1 and 183, and a lower number indicates greater ease of doing business. Cote d’Ivoire, Uzbekistan, Laos, and Iraq. Many of these bottom 20 states have already been directly highlighted elsewhere in this blog. All on this list, however, have been indirectly discussed. Common struggles include: authoritarian tendencies in governance, lack of the rule of law, high levels of corruption, poor infrastructure, and arbitrary judicial proceedings. Even so, some critically weak or failed states perform somewhat better on this World Bank survey. Though hardly excelling, Afghanistan is just outside the bottom 20, at 160th. Pakistan has a middle ranking (105th), and Nigeria (133rd) has made some significant progress since the end of military rule in 1999. Other low-income and/or modestly weak states also perform fairly well in the ranking. These include: Georgia (16th), Colombia (42nd), Rwanda (45th), Mexico (53rd), Ghana (63rd), and Zambia (84th). What are your thoughts about the Doing Business survey? Is it a helpful tool for assessing governmental effectiveness? Is the survey unduly biased towards free market-oriented principles? Do you have personal reflections that relate to doing business abroad? 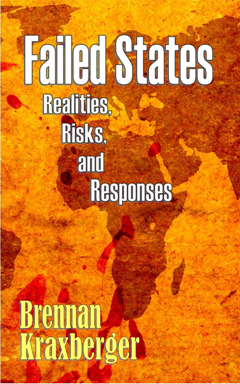 For many, Pakistan is the most worrisome critically weak or failed state. It has a huge population (about 180 million people) with a relatively limited base of natural resources and arable land. The country has persisting deep ethno-regional divisions, despite a common Islamic heritage. Since its independence in 1947, the central government has not proven capable of administering peripheral regions of the state. And, not least, Pakistan’s relations with its neighbors have long been characterized by tensions and open conflict. And, we could go on …. There are some 20,000 “shelterless” schools throughout Pakistan. And even when there are buildings, 60 percent have no electricity, and 40 percent have no drinking water. Because the schools are so bad, Pakistan has the lowest enrollment rate in all of South Asia. To be clear, millions of Pakistani kids attend classes in makeshift outdoor spaces. For those with buildings, they are rarely minimally equipped for instruction and learning. Though the film clearly emphasizes the worst of Pakistan’s schools, this portrait provides significant insight into the whole system. Leaving other issues aside, such as teacher recruitment and retention, curriculum, and ideology, Pakistan’s educational deficit provides stark evidence of state weakness. In terms of educational outcomes, there is truly a vast “lost generation” of illiterate and uneducated in Pakistan. That legacy will hinder future political and economic development for decades to come. Beyond this, however, is the contemporary reality of governance. The physical status of the country’s schools is not just a reflection of the country’s poverty. Though Pakistan is a low-income society, incompetence and corruption have led to terrible delivery of services. Construction contractors are paid for work that was never completed in part or whole. Civil servants are not held accountable for their malfeasance. At the same time, elites send their children to private schools, the main preserve of quality education. Going forward, it is not clear that outsiders can do much to reform Pakistan’s schools. After all, reforming the educational system will require better governance, not just technocratic fixes.